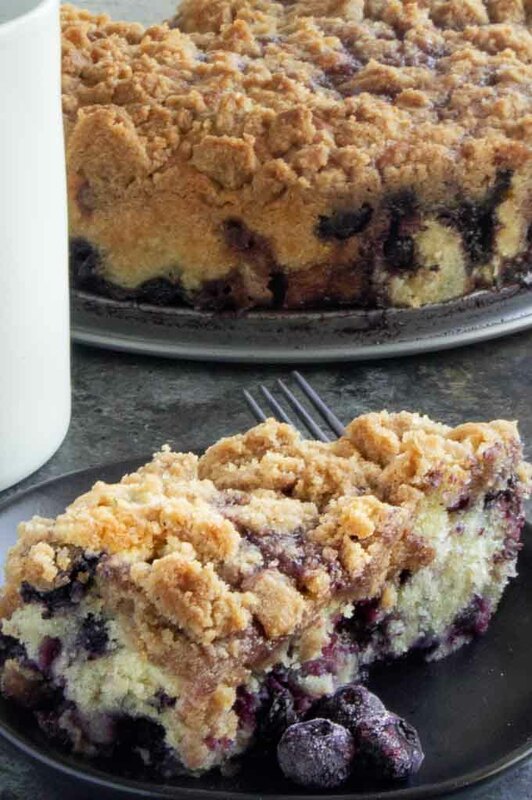 Todays recipe for Blueberry Buckle is a family favorite. 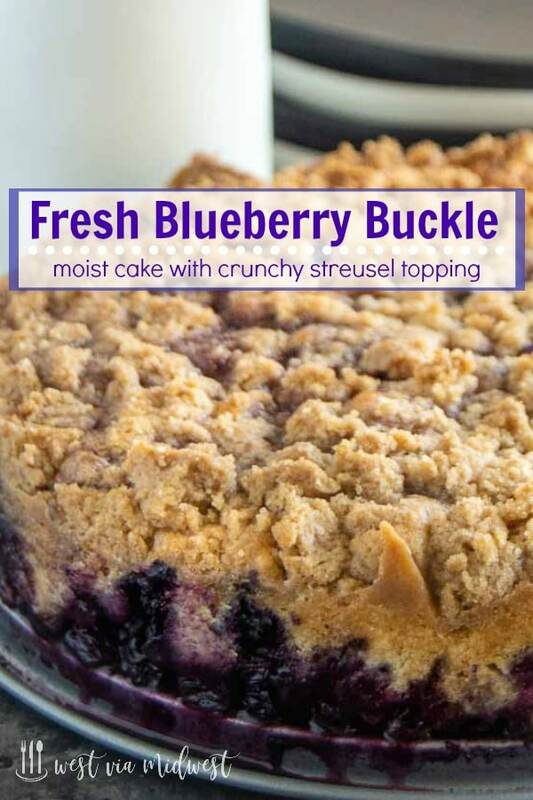 Fresh blueberries in a light moist cake topped with the sweet, crunchy streusel topping. It reminds me a lot of the baking my Grandma used to do when I was growing up. Buckles, pies, cakes, slumps, grunts, pandowdies, crisps and cobblers. You name it my Grandma Hyde would bake it and it would be amazing. While I love all things blueberry like these Lemon Blueberry muffins recipe here I also like a mix of crunchy sugar topping with a moist crumb cake. 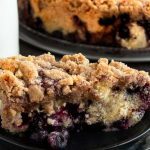 The blueberry buckle is great for serving for a dessert but it can also be served as a sweet item for a potluck or on a brunch buffet. The cake is easily cut into squares for serving like a coffee cake. It’s wonderful around the holidays because you can not only make it ahead, you can have your fruit in a breakfast cake! Who doesn’t want cake for breakfast!?! What is the difference between a Slump/Grunt, Buckle, Crisp, Cobbler, Brown Betty and a Pandowdy? What? All these strange names from a bygone era. The one thing that all of these things have in common is that it has fruit in it, but after that there are subtle differences. Crisp: baked fruit with a topping such as a streusel, granola, nuts and often oatmeal. Sometimes its also called a crumble for the way the topping looks. Cobbler: baked fruit with a biscuit or batter topping. The topping is dropped or spooned on and imagine cobbling the pieces together to cover the top. Grunt/Slump: fruit cooked on the stovetop (stewed) with a biscuit or dumpling topping. The topping is baked on the stovetop in a covered skillet ( steaming it so its very very moist.) It’s said that as the topping cooks when it releases steam you can hear it grunt! Depending on where you live determines whether you call it a grunt or a slump. Brown Betty: Baked fruit that is layered with the batter in between before cooking. Often Brown Betties use cut out pieces of crusts in special shapes for a unique presentation. Buckle: A buckle is a cake with fruit mixed into it and has a streusel topping. Its very similar to a coffee cake, although most coffee cakes don’t have fruit in them so it has its own classification. The moist cake and crunchy, sweet streusel topping are identical though! Easily served as it can be cut into squares! 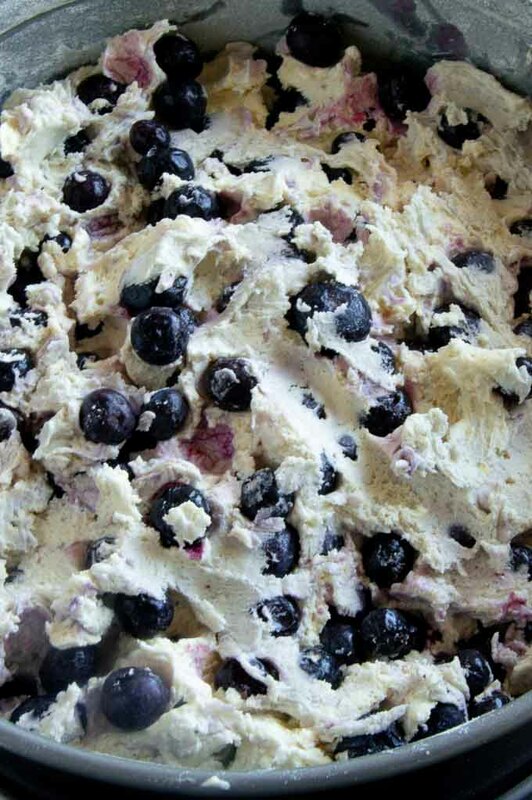 How do you make a Blueberry Buckle? 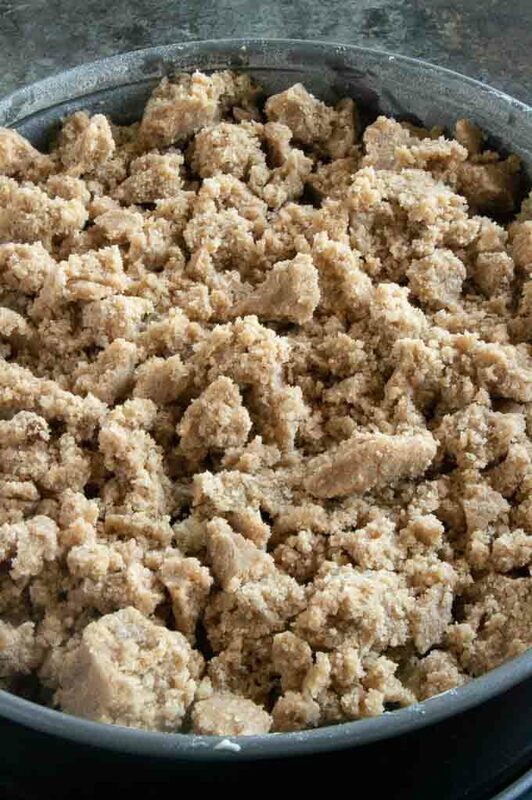 Make a streusel topping with brown sugar, sugar, cinnamon, salt and butter. You’ll mix it in a blender and will look very much like wet sand. Mix the breakfast cake ingredients separately. first mix the flour and the baking powder making sure the baking powder is dispersed evenly. I use a wire whisk to blend it well. Slowly add the flour mixture in small batches so it doesnt fly all over. You’ll mix until all the dry ingredients are incorporated. At this point you can add the blueberries by hand. Mix them with broad stirring motion trying to mix just enough that they are spread throughout. Over mixing them will turn your batter blue! Sprinkle streusel topping evenly over the top. Bake until a toothpick or knife come out cleanly. PRO TIP: When putting the streusel on top, use your hands to make large clumps. As you spread the streusel topping over the blueberry buckle batter pay careful attention that the clumps stay large. Some breakage is good, but this way you will have big bites of struessel with both soft inside and crunchy outside after baking! Can you use frozen blueberries? Absolutely. Run water over them in a strainer to remove any ice crystals on them. Then spread them out on a paper towel to wipe off any excess water. Water added to the batter will increase the color of blue transferring and it will also change the texture of your cake. 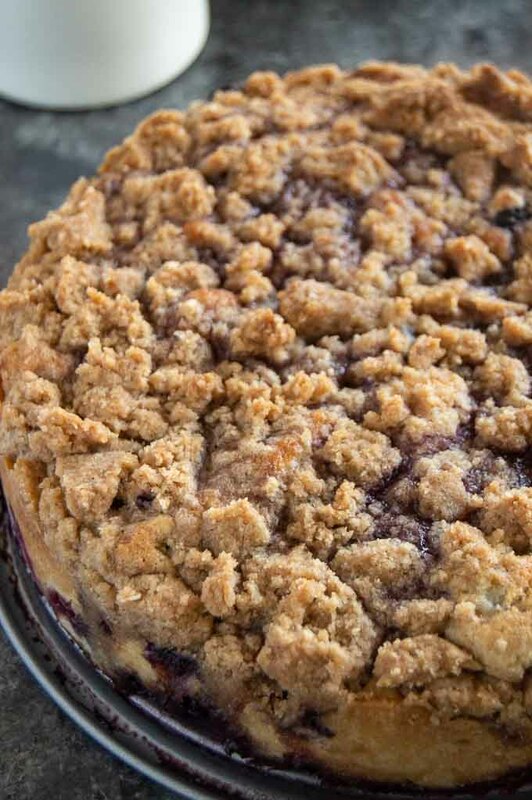 Can you freeze blueberry buckle? I did try to freeze it but the sugar streusel got really grainy and wasn’t pleasant. I only tested freezing it so I could answer that question as it always seems to be asked about baked goods. The blueberry breakfast cake is so good, I promise you there wont be any left! How do you prepare the pan? use a small pat of butter and run it over the sides and bottom of the pan. Then take a couple of tablespoons of flour and sprinkle it over the bottom. Using your hands turn the pan all around until all the buttered areas are covered with flour. Remove any excess flour. Your cake will easily come out from the pan after baking if you do this! More Classic Fruit recipes you might enjoy! Pin this recipe to your Buffet Recipes Board or your Fruit Desserts board! This recipe is slightly adapted from Cooks Illustrated. All credit for its delicious perfection goes to them! 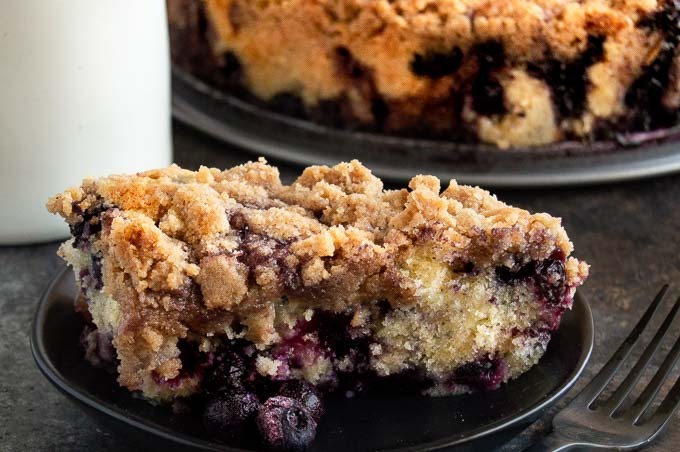 This Blueberry Buckle recipe is full of fresh juicy blueberries in a moist crumb cake that is topped with a crunchy sweet streusel for a bite of sweet, tart, moist and crunchy in every bit! Ideal for serving as a dessert or a breakfast cake! 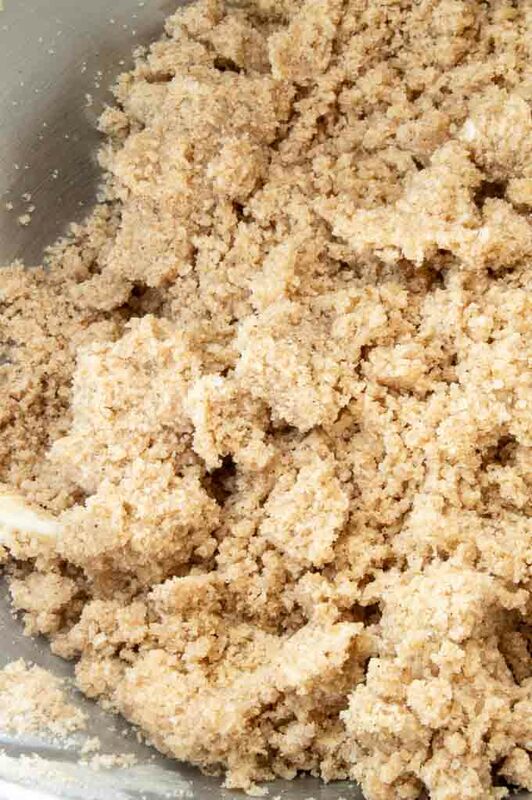 Combine ingredients all for the streusel except the butter in a mixing bowl for your mixer. Mix on low until combined, then add butter. Mix for 3-4 minutes until all butter is incorporated. Mixture will look like damp sugar... no butter will be distinguishable. Preheat oven to 350° Butter a 9" pan, then flour and set aside. Mix flour and baking powder in a bowl. Use a whisk to mix well. Set aside. In a stand mixer fitted with a paddle, beat the butter, sugar, salt, and zest on medium until light and fluffy about 3 minutes. Beat in vanilla, about 30 seconds. Add eggs one at a time until incorporated, batter will appear broken. On a low speed add flour in 2 - 3 batches. Once its almost incorporated remove bowl from mixer, scrape down sides and stir with spatula until all flour is mixed in. Stir in blueberries (see post about drying blueberries) in as few strokes as possible to mix throughout. Using the spatula, put the thickened batter into the prepared pan. Spread evenly. Take streusel and make clumps with your fist and sprinkle on top of batter. Cover entire top with streusel. Bake until cake is golden brown and toothpick comes out clean, about 50-55 minutes. Transfer to wire rack and let cool at least 20 minutes before serving. This recipe is slightly adapted from Cook's Illustrated. All credit to its deliciousness goes to them! I would totally want a big piece of this for breakfast! I’d never heard of a “buckle” until this recipe and now I’m hooked! So much blueberry goodness in this breakfast cake, I could seriously eat it every day! This was the perfect recipe to use some of my blueberry stash from my recent blueberry picking trip. My family loved the cake for dessert and I enjoyed it with my coffee the next morning. Easy to make and so delicious – thank you! Everything about this recipe is perfection! Love the streusel topping! These are super easy for BBQs and pot lucks or Pitch In as I was told they were called in Indiana. I used to make these for church all the time and they were always devoured!! I have learned so much from this post! I didn’t know all the subtle differences between all those baked goods! This buckle looks delicious. I am going to make it for my husband this week. He loves coffee cakes, blueberries and everything with a streusel on top! Yum! This looks just delicious! I love the streusel topping, sweet crunchy deliciousness!